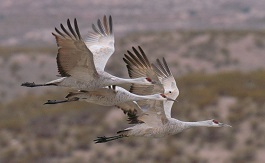 PHOENIX — The Arizona Game and Fish Department has posted the 2017 Arizona Sandhill Crane Regulations online at https://www.azgfd.com/Hunting/Regulations/. The deadline for the department to receive applications for sandhill crane hunt permit-tags is Aug. 25, 2017. No applications will be accepted after this date, regardless of postmark. All applicants must use hunt permit-tag application forms. Applications will be accepted — by mail only — at the following addresses: P.O. Box 74020, Phoenix, AZ, 85087-1052; or 5000 W. Carefree Highway, Phoenix, AZ, 85086-5000. These applications cannot be hand-delivered to any department office. All hunt permit-tags will be mailed by Sept. 11, 2017. The hunt permit-tag fee is $43 for Arizona residents, $45 for non-residents (each successful applicant will receive three hunt permit-tags). In order to participate in the random draw, an applicant must have or apply for a valid hunting license. If an applicant is not licensed at the time of application, he or she must purchase a license by completing the license form section and include payment with the application. The first of 10 three-day seasons begins Nov. 17, the latest starts Dec. 11. A three-day, youth-only season begins Dec. 8. The bag and possession limit is three sandhill cranes per calendar year.